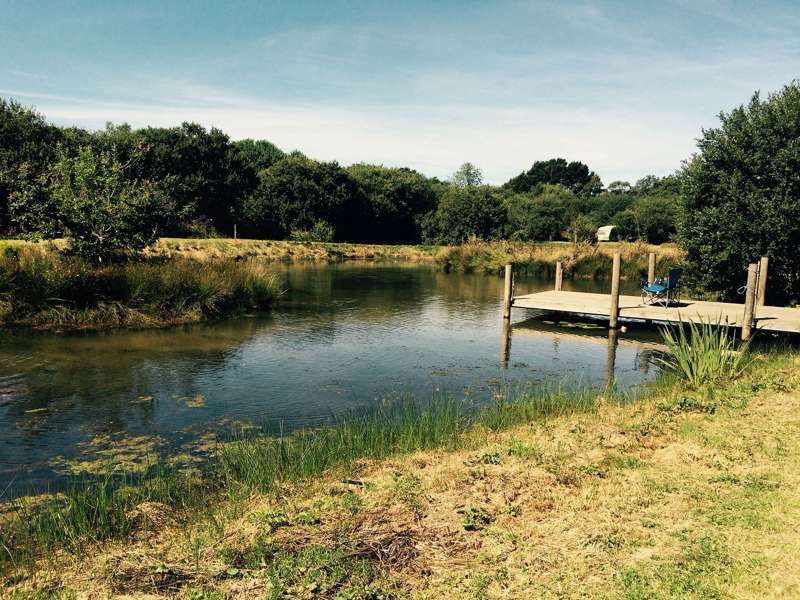 At our small and friendly site you can experience ‘real camping’ with plenty of space, real campfires, pretty fields, shallow streams, small lakes with rowing boats and an abundance of wildlife. Our site is very relaxed; we don’t have set pitches so you can pitch your tent where you choose in our camping fields. Our electric hook up pitches are in a pretty grass field but please note this field is separate to the main camping field with the small lake, toilet and shower block so it's a short walk through the gardens to the toilets. We welcome families, groups and couples, anyone looking for a countryside retreat. Children especially love to explore our site, wading in the stream in wellies, rowing around the lake, looking for the farm animals or hunting for the hidden rope swings. There’s always animals to meet at our farm, on our site you can see wild geese, owls, hawks, buzzards, herons, jays, rabbits, foxes, badgers, field mice, trout in the stream. Or you can meet our friendly animals, our miniature goats Matilda, Bluebell and Rose, our pigs Rodney and Del Boy and our Chickens and Ducks. We sell the Duck and Chicken eggs for your breakfast as well as a selection of home grown plants. Our ethos is simple and natural. Therefore we have no clubhouse or constant traffic noise and we are a real escape from everyday pressures. We offer simple shower and toilet facilities and plenty of space to enjoy your holiday. Children are very welcome but due to the local wildlife, unfortunately no pets are allowed. Campfires are permitted, in designated fire rings and sacks of logs are available for purchase. We are in a little hamlet near to the village of Sticker, which is a 10-minute walk away. Sticker has a picturesque country pub, the Hewas Inn, a shop and a children’s play park. Grigg’s farm restaurant is a short 5 minute stroll from the campsite, they do a great cooked breakfast if you forgot your baked beans. The nearest town is St Austell, only 2 miles away, where all major supplies can be obtained, i.e. petrol, supermarket goods etc. We are near to both the Eden project & The Lost Gardens of Heligan, a must for plant and garden enthusiasts. We are only 3 miles from stunning coastline, beautiful sandy beaches, rugged cliffs and out-of-the-way coves, making us an ideal base for walking, exploring and cycling (Pentewan has an excellent bike trail running alongside a river). We’re located at the gateway to the beautiful Roseland Peninsular, a stunning and less discovered area of Cornwall, full of pretty villages, quiet and rugged beaches and dramatic coastal paths. The elegant cathedral city of Truro is 11 miles away. Mevagissey and Charlestown are historic ports about 4 miles away, and well worth visiting. Fishing and boat trips are available. The north coast is a surfing Mecca with its large beaches and is only a 30-minute drive away. Get back to nature at Pleasant Streams Farm Camping. We offer peaceful and rustic camping in lovely rural surroundings with basic facilities and low prices. At our small and friendly site you can experience ‘real camping’ with plenty of space, real campfires, pretty fields, shallow streams, small lakes with rowing boats and an abundance of wildlife. Our site is very relaxed; we don’t have set pitches so you can pitch your tent where you choose in our camping fields. We welcome families, groups and couples, anyone looking for a countryside retreat. Children especially love to explore our site, wading in the stream in wellies, rowing around the lake, looking for the farm animals or hunting for the hidden rope swings. We are tucked away in the countryside in mid Cornwall, a great base to explore the beautiful Cornish coast and attractions from. Our location is very quiet and peaceful, yet we are close to a village and town. The nearest beach is only a 10-minute drive and we’re at the gateway to the beautiful Roseland peninsular with more stunning beaches and pretty villages to explore. Our ethos is simple and natural. Therefore we have no clubhouse or constant traffic noise and we are a real escape from everyday pressures. We offer simple shower and toilet facilities in a basic wooden hut and plenty of space to enjoy your holiday. Unfortunately no pets are allowed. Campfires are permitted, in a limited amount of designated fire rings which are first come first served and sacks of logs are available for purchase. Please note we do not have a designated washing up area but you are welcome to take water back to your tent, so we recommend you bring a washing up bowl. Campfires allowed. 50 pitches with basic showers, proper toilets and a water-tap for washing up. Newly-built additional compost toilets and showers have been built for the 2019 season. 2 vintage caravans, one 4/5 berth, one 2x2 berth. Sea kayak for hire to explore all the hidden coves of the Cornish coast. Space for 50 tent pitches in 2 camping fields, one with a small lake and one large, flat and sunny field without a lake. 6 electric hook up pitches available in the camping field without a lake. Tents, campervans, caravans, groups – yes. Dogs – no. Explore the coast by kayak (on hire from the campsite for £25 per day), or freewheel along the Pentewan Valley Trail with Pentewan Valley Cycle Hire (01726 844242). Close to the Lost Gardens of Heligan (01726 845100) and The Eden Project (01726 811911), both a must for garden and plant enthusiasts. The fishing village of Mevagissey and historic port of Charletown are a short drive, both well worth a visit, with shops, cafes and restaurants to explore. It’s a 15-minute stroll to the Hewas Inn (01726 73497), which serves a traditional pub menu and a selection of good ales from St Austell Ales. The Polgooth Inn (01726 74089) – a 5-minute drive – offers a more contemporary choice, and an impressive range of cask ales. From the A390 between St Austell and Truro take the Hewas Water exit and turn right towards Lower Sticker. Go straight over a crossroads and it’s on the right. A bus service runs from St Austell and stops at Sticker, 10–15 minutes’ walk from the site.